(CNN) - Three years after the nation elected its first African-American president, the Republican Party could make its own history - given his rising poll numbers and raised awareness among voters and in the press, Herman Cain is the first African-American to have a real shot at becoming the Republican presidential nominee. So why isn't Cain's ethnicity as much a part of his story as it was with Obama? For one, many conservatives decry the focus on a candidate's race as an obsession for liberals. "I think that his supporters are more focused on who he is and his principles," Luke Livingston told CNN. Livingston is the executive producer of the 2009 documentary, "The Tea Party Movie." "Regardless of your race, whether you're Hispanic, black, white, Jew, Gentile whatever – you get up on that platform and you talk about the principles of our founding fathers and people look past race," Livingston added. "Now the Left is going to put that out front." There's a second reason that some conservatives, particularly tea partiers, largely ignore Cain's race: it drives a stake through claims that the movement harbors racists. Last summer, the nation's oldest civil rights group – the NAACP – lashed spectacular claims that the tea party was not doing enough to dispel racism. Amid vehement denials from the tea party, that notion has taken hold with some of the movement's critics. Meanwhile, Cain has long been a tea party favorite. A former radio talk show host, Cain has been a sought-after speaker at many rallies, is frequently praised by tea party members, and even won the Tea Party Patriots' presidential straw poll at their first summit in Phoenix, Arizona, in February. Cain won nearly 22 percent of the nearly 1,600 votes cast at the summit. Texas Rep. Ron Paul won nearly half the votes cast by more than 2,300 online registered attendees. "The mood at this summit shows that Tea Party activists are looking for leaders who share our principles of fiscal responsibility and limited government and who will vow to uphold policies that reflect those principles once in office," Jenny Beth Martin, national coordinator of Tea Party Patriots, said at the time. Livingston said he thinks "people are encouraged that there are black conservatives, because the tea party has been labeled as racist ….But I don't think [tea partiers] are making it a big deal." Martin echoed a similar sentiment. Her group is the nation's largest in the tea party movement. "I think that having an African-American with so much tea party support does show that, yeah – it's another example that the tea party movement is not racist," Martin said. "[It shows] that we're looking at the issues and we're not looking at skin color." Time magazine's Michael Crowley told CNN's "John King, USA" that while Cain's skin color isn't central to his candidacy, it does have its appeal. It's something that conservatives really like about him," Crowley said. "To have someone like Herman Cain come out to kind of fight back and to have a black man saying this is exaggerated, it's overstated, the Republican Party is not racist and a different set of possibilities for what you could have from a black candidate I think really does energize a lot of white conservatives." Cain's race hasn't totally been ignored, though. Recently, in an interview with MSNBC, host Lawrence O'Donnell pressed Cain: Why didn't he participate in the civil rights movement? Cain answered: "I was a high school student. The college students were doing the sit-ins. The college students were doing the freedom rides. If I had been a college student I probably would have been participating." During a recent interview with CNN Chief Political Correspondent Candy Crowley – host of CNN's "State of the Union" – Cain said that African-Americans "weren't held back because of racism." "People sometimes hold themselves back because they want to use racism as an excuse for them not being able to achieve what they want to achieve," Cain added. Cain told CNN's Wolf Blitzer that blacks had been "brainwashed" into not considering a conservative point of view. And in a radio interview with conservative host Neal Boortz, Cain said the attention on his being a black conservative are "racist," in and of itself. "A lot of these liberal, leftist folk in this country, that are black, they're more racist than the white people that they're claiming to be racist," the candidate said. "How dare Herman Cain, first, run as a Republican? 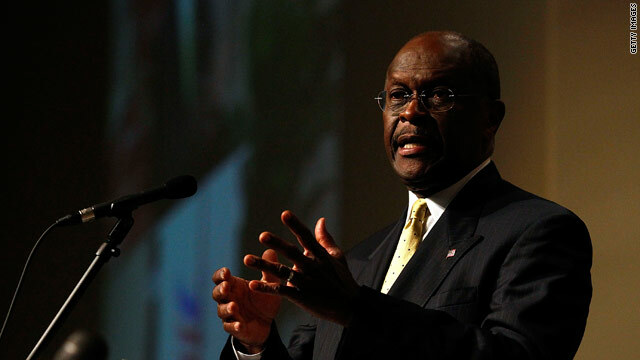 How dare Herman Cain be conservative? And how dare he move up in the polls, so that he just might challenge our beloved Obama? That's the problem they have." Then Cain essentially waded into the "who's more black" controversy – him or Obama. "He's never been part of the black experience in America," Cain said. "I can talk about that. I can talk about what it really meant to be 'po' before I was poor." Conservative radio hosts took that a step further. "Herman Cain, if he became president, he would be the first black president,"Laura Ingraham said last week on her show. "Does he have a white mother, white father, grandparents? No, right?" "Herman Cain could be our first authentically black president," fellow conservative radio host Rush Limbaugh also said recently. Limbaugh theorized that, in 2008, some liberals challenged Obama's ethnic authenticity given that his mother was white and his father was not African-American, but an African from Kenya. These barbs from frequent Obama flame-throwers are surely meant as an intentional diss. By any reasonable measure, the president holds the title of being the first African-American to occupy the White House. But what is also true is that Cain's candidacy in the Republican presidential race also carries a historic imprint. The fact that there is a debate about whether Herman Cain is MORE "black" than President Obama, and whether Obama even qualifies to be an "African-American" based on his genealogy, PROVES THAT RACISM IS AS ALIVE IN AMERICA AS IT EVER WAS. Racism will always be alive and well in this country. Have you forgotten the part of the country that is south of New York and east of New Mexico? That part of the country will always be more racist that the rest of the country and it will show in their voting pattern. We will see. "The list goes on and on. Why would anyone vote for this guy? He is a box of rocks." There is no intention of anyone voting for this guy. He does, however, make a great foil for those not yet interested in voting for Romney. And will most likely get those voters who haven't yet seen the light of endorsing Romney to do so ... pronto. Hence all the Cain media coverage. Cain is a threat ... but NOT to Barack Obama, or Democrats. The threat that he COULD conceivably receive the GOP nomination IS the controlling factor of a GOP lead mindset attempting to light the fire under those not yet endorsing Mittens. Can you imagine the confusion at the polls if he runs against Obama? The Democrats have always said the republicans are the old fat white man’s party. If they run a black man then what rhetoric will they use? I'm sure they'll think of something. "People sometimes hold themselves back because they want to use racism as an excuse for them not being able to achieve what they want to achieve." LOL its truly comical...what an idiot. Obama won't even need to campaign if this guy gets the nomination. I beg to differ. Race is going to be an even bigger issue because the Tea Party's racist element will do what it can to make sure that Obama is not re-elected. Cain is only coming to the forefront of the debates because the GOP wants to try to demonstrate that they have no problem with people of skin. The GOP will lose more of its base if it puts a black candidate on the ballot. Cain's rise reminds me of the underhandedness of the GOP in 2008. They saw how popular Hillary Clinton was with the Democratic party and tried to steal their thunder by plugging in Sarah Palin. Fortunately, the same people that would vote for Hillary Clinton knew well enough that Sarah Palin was just a dumb bimbo consolation prize offering from the GOP. These tactics by the GOP are so underhanded that I still can't see how so many of the "99%ers" actually vote for them. "Chris – @ Carla Because that's what lots of black politicians (who are traditionally democrat/liberal) make it all about." I am a very conservative person. Race has NEVER been a consideration in any of the political choices I have made, NEVER. I will vote this year as I voted last, for the candidate I feel would be best for the job. I have never really considered myself as having any sort of political affiliation either. Just do the freak-ing job, I don't care if you are black, white, purple or sky blue pink for crying out loud! Keep the political focus on running the dang country and stay out of my marriage bed and physician's office for a while! I can really handle my own personal decisions. I can make those choices for myself. I am pretty good at knowing what my family needs and doing what I have to in order to meet those needs, but I can not withstand the constant deterioration of this country's economy. Whatever hat you wear on the campaign trail needs to get packed for the trip to the White House and the words spoken need not just become another pretty speach of unfullfilled promises! I think that the general populace feels the same and will show that come election time. We are once again and always be "We the people..."!!!!! Cain just destroyed this country. . .this divisiveness wasn't needed. Of course race matters. Herman Cain wouldn't have a shot of anything if a black man had not become president. Republicans are looking to Cain to challenge for the black vote. Period. Conservatives are just trying to get points for supporting an African-American nominee. Most of America would be outraged if they showed the slightest racism; they're only supporting him out of need. His ideas are easily beaten by other candidates and its scary that he is now gaining more support.